Everyone has their own method for doing a Thai Beef Salad and this is mine. 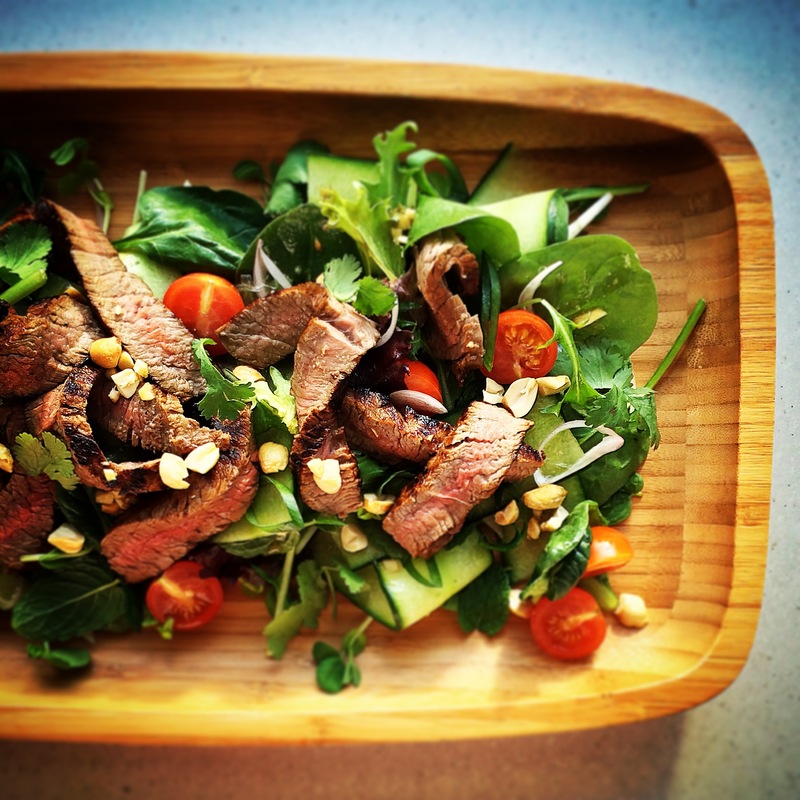 This Thai Beef Salad is gluten-free, dairy free and grain free. I’ve listed just the basic salad ingredients, you could also add finely sliced capsicum, julienned carrots, snow pea sprouts, bean sprouts, rice noodles and fresh chilli. All can be prepared ahead and will take 15 mins to cook. Mix the lime juice, ginger, garlic, sugar, oil, fish sauce, soy and white pepper in a jar and shake to combine. Take 2 tablespoons of dressing and marinate the steak for at least an hour or overnight. Start arranging the salad, place mixed lettuce, cucumber ribbons, cherry tomatoes, mint, coriander, Thai basil on a large platter. Heat a BBQ or fry pan over high heat, cook steak to your liking, rest the steak, then slice across the grain into thin ribbons. Scatter the steak over your salad, pour over the reserved dressing, garnish with peanuts and fresh chilli. *I have these items stored in freezer. Grate ginger straight from freezer and microwave limes at 30 sec increments till defrosted. ** can use Tamari, just halve the quantity. love the use of cherry tomatoes, basil, coriander..Fresh!